Update December 2009 Forget my comment (last August) about the Panama berry being a "light fruiter". This summer despite the drought it is loaded with hundreds and hundreds of delicious red berries. This tree could solve the World food shortage! 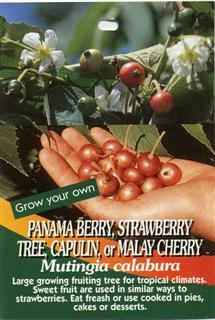 The Panama Berry must be close to the fastest-growing tree in the world! Planted out of the pot in May 2008 at about 800mm high. Started flowering in June 2008 a month later had set first fruit. Now close to 5 metres (see photo). Has flowered and continued to set fruit since then even during our Brisbane winter season. Four incredibly delicious berries today 12 August 2009. Do not plant anywhere where you can't handle a large (4-5 m spread) tree appearing rather suddenly and intending to stay that way. Grasshoppers appear to be the only pests. Birds can be a problem stealing the fruit. Lots of flowers but only in November. Now setting berries (8 th December 2009) which I expect to be eating by Christmas. Planted May 2008 in a rather dry spot, but fertilised with Thrive and watered well with tank water. Grew rapidly in the spring and produced several berries Oct 2008. Continued to grow throughout the summer and now has many climbing runners 3 to 4 metres in length.